Matisse’s Startling Late Works: The Cut-Outs. No wonder Henri Matisse is well loved. His works are sensuous, jubilant, gorgeous: they envelop and immerse the viewer in voluptuousness, in light that finds itself materialised as coloured form, coloured space. His work is popular and much of it is well known; he is celebrated for the joyous rhythms, the unabashed pleasure in and of his works. Yet none of this foreknowledge prepares one for the sheer delight – and the wealth of information – that is afforded by the overwhelming presence of these cut-outs seen en masse, and, so to speak, ‘in the flesh.’ The Tate Modern is now holding the most comprehensive exhibition ever dedicated to Matisse’s papiers découpés. It brings together 130 works from the final chapter of the artist’s life, but these in no way constitute what is generally thought of as a ‘late style.’ Their palpable vigour, their contained, vernal joyousness, and the sheer cleverness of them, all belie any notion of an artist in the autumn or winter of his days. Forms appear and are reiterated – birds, long-fingered leaves, sensuous and pared down female torsos, corkscrews. Certain colours predominate (cobalt blue, cadmium yellow, black, green, magenta). All this is familiar. Yet a closer inspection shows us that nothing is predictable, everything is simultaneously improvised and newly thought through. In short, if one is only familiar with Matisse’s cut-outs from reproductions, nothing could prepare one for a live confrontation with these works. The Tate show covers the last thirteen years of Matisse’s life, when, after undergoing radical surgery for colon cancer at the age of 71, he found himself at first wheelchair bound, and eventually bed bound. His bedroom in his villa Le Rêve in Vence was transformed into a studio and, simultaneously, into a reverie of outdoor space that he filled with imagined bowers and paradisiac paper gardens. His only tool was a pair of long-bladed scissors, his medium was sheets of paper that his assistants would have painted in a relatively limited array of vivid and specific hues. His assistants, in particular the glamorous, Russian-born Lydia Delectorskaya, became his prosthetic limbs, not only the arms that pinned the cut-outs to the wall, but also the legs that danced about under the artist’s instruction, until the precise position for placing the cut-out form on the wall was found. One of the delights of the exhibition is that it manages to present these familiar images not as completed, finished, closed works, but as part of a dynamic work-in-progress; indeed exhibition and catalogue together create a fairly precise and detailed picture of Matisse’s working procedure. This entails showing us the progression of these cut-outs, from the first simple experiments to the final, sweeping, synthetic works (evocative at once of stained glass and modern tapestry – it is no coincidence that Matisse’s work was so readily translated into both glass and textile). But this focus on working methods and procedure also entails a backward glance, a nod towards the significant pre-history of the cut-out in Matisse’s practice. We see the origins of the autonomous cut-outs in much earlier works where, in his search for the perfectly balanced (which is not to say symmetrical) still life composition – unlike his prickly contemporary Picasso, Matisse believed art should be as comfortable as an armchair – Matisse would cut forms out of stiff paper and pin them onto the canvas, playing around with the placement, scale and degree of overlap of the forms that he was then finally to fix in an apparently ‘spontaneous’ painting. The countless pin-pricks visible in all the finished works are evidence of this provisional practice, in the early cut-outs rehearsing the overall shape of the painting before committing the individual forms to their assigned place in a composition, in the late cut-outs essaying the most economic, succinct, evocative, lyrical way of using those forms. But there is much more that seeing these works together, and ‘live,’ yields. For one, there is the tremendous variety of scale, from the small designs for artists’ book and magazines (Jazz, Verve) to the vast, wall-sized decorative compositions (Large Decoration with Masks, 1953). Then, reproduction belies the surface of the works, suggesting that each coloured shape is uniformly flat. In fact, because the paper that Matisse uses for the cut-outs is hand painted, and these matte, gouache surfaces frequently retain the traces of the manual gesture entailed in the application of the pigment, as well as, more surprisingly, degrees of transparency and opacity. In this sense, the cut-outs speak directly to Matisse’s paintings, where brushy areas of luminous colour are played off against areas that are denser, dryer. Then, there are the tiny, jagged cut edges that retain the trace and memory of scissors working their way around a shape. Nothing could more concisely contain the energy of making in reduced physical circumstances: these edges hold a degree of dynamism that is belied by the flatness of reproduction. Finally, in addition to the pin pricks, pencil marks within the compositions, together with areas where a shape will have been composed of various overlaid bits of paper rather than simply being cut out in a single ‘sitting’, attest to the experimental, improvisatory and dynamic nature of Matisse’s facture. Matisse frequently spoke of ‘the eternal conflict of drawing and colour’, and through the different phases of his work, line and colour have enjoyed varied forms of reciprocation. The film clips included in the exhibition, showing Matisse wielding his scissors in his wheelchair, triangulate this essential binary term drawing/colour. Watching the forms fall from his scissors, one becomes aware that cutting is not only a means of drawing, but also a means of cutting away, and as such, it performs an exploration of three-dimensional space. Later artists have played with these two potentialities of the cut-out – I am thinking of Kara Walker and, more interestingly, William Kentridge – but here in Matisse one sees the earliest germs of an entirely innovative exploration of three-dimensional space, using the most unpredictable and apparently two-dimensional of means. 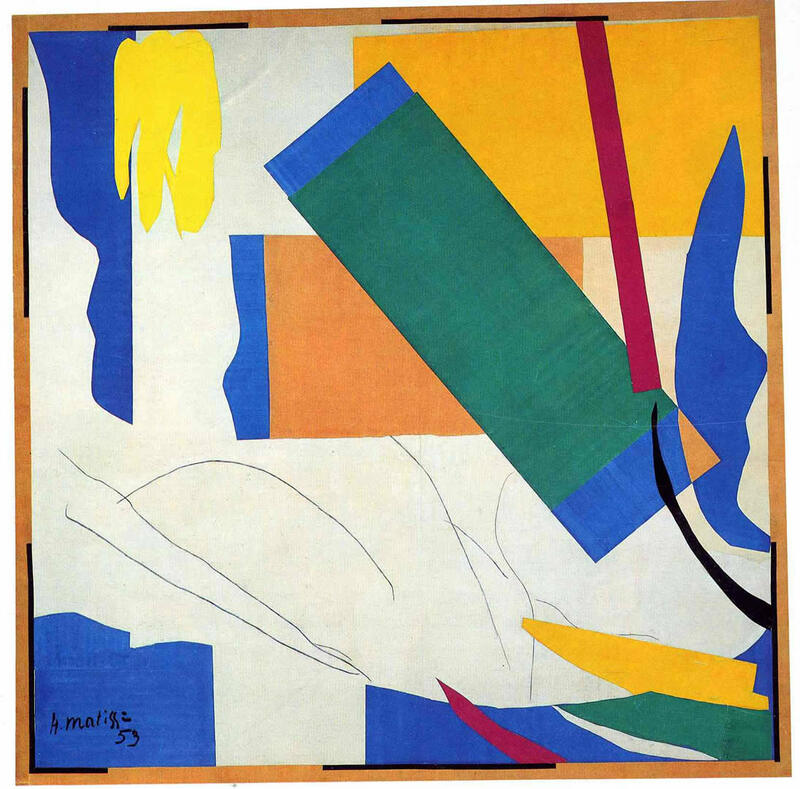 The sculptural potential of the cut-out is least convincing where, in some of his later works, Matisse layers decoratively cut forms on top of each other, or where his drawing with cut paper creates a diagonal that ostensibly displaces three-dimensional space, as in the table in Zulma (1950). The outcome is certainly one of greater complexity, but it is perhaps the startling simplicity that constitutes Matisse’s boldest contribution. While creating a shallow but distinctly three-dimensional space, in these layered works, the whole remains intrinsically pictorial. It is in those most pared down, and apparently insubstantial of late works, the blue monochrome figures of the four female nudes (1952), that a sculptural exploration becomes most explicit, to the extent that the curators, Nicholas Serrota and Nicholas Cullinan, have included some of Matisse’s own early sculptures of female nudes in vitrines alongside these blue figures, to press the point home. The juxtaposition is breathtaking, and highlights what is already evident in the flattened nudes. Here, gaps and incisions in the sensuous volumes bring the white of the ground in to wrap around or interrupt the cobalt figure, in a process that Matisse called ‘aeration.’ Cut and flat shape join forces to stand in for the body’s yogic twists and loops through space. 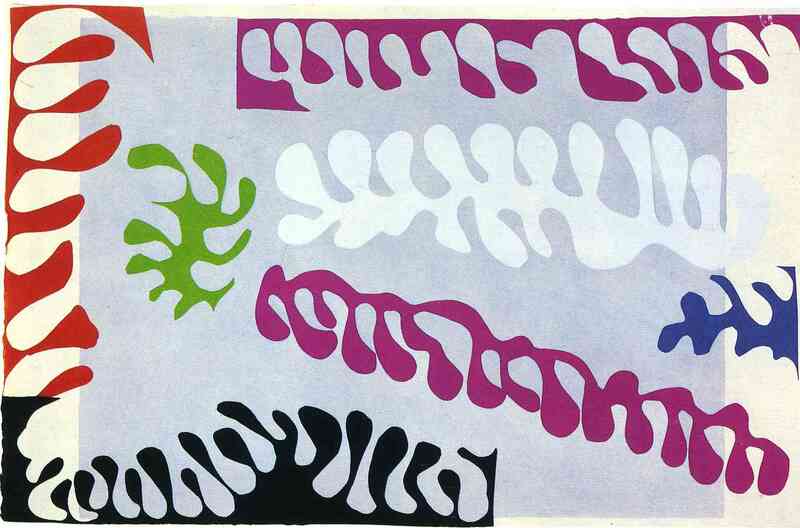 Indeed, the rhythmic organisation of form against ground makes even the concept of ‘ground’ in Matisse’s cut-outs spurious. Not only does the white of the surface sing out as an important colour, but the negative shapes that it forms become legible as decorative elements in their own right. 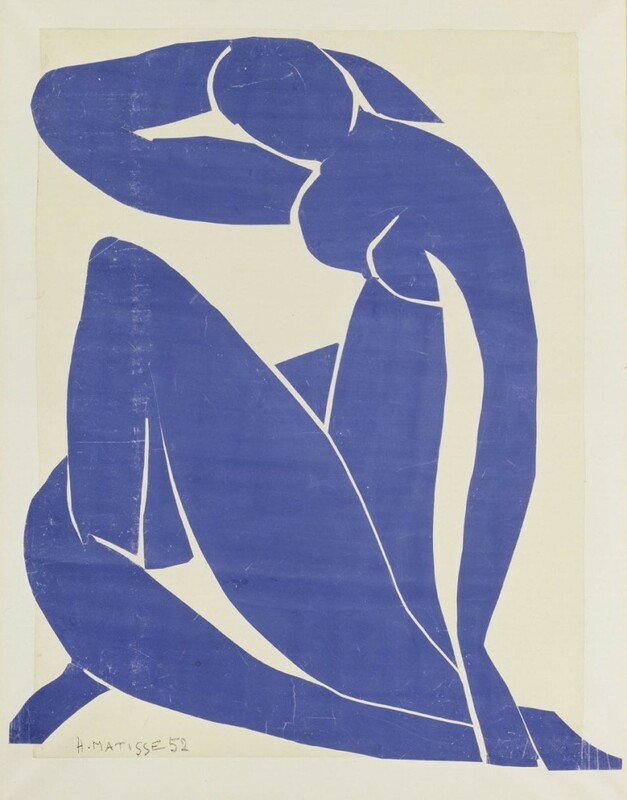 In Matisse’s use of the reversed sections of cut papers, and in the judicious interplay of edges (he is particularly clever in his manipulation of what goes on at the very outer edge of the image, the place where it ostensibly ‘finishes’), the notions of ‘figure’ and ‘ground’ become both reversible and exchangeable. Look, for instance, at all the overlaps and edges in the well known plates for the book Jazz (1947), such as The Knife Thrower (Plate XV) or Lagoon (Plate XVII). Near the end of the exhibition, the familiar and always fresh large Snail from the Tate’s own collection, continues to surprise. For here, the process of cutting has become rougher, more impatient, and other than a sly visual joke in the small cut-out snail shape top left, drawing, colour and shaping are, so to speak, unpacked and dismembered. Here, in other words, the shapes are no longer cut out to describe forms; rather, the descriptive form is reassembled out of purely abstract shapes, squares spiralling slowly to evoke the essence of ‘snailness.’ And where the Oceania murals were obviously the flowering of a memory of his trip to Oceania, the later work Memory of Oceania, sister work to Snail and dated from approximately the same time, contains perhaps the most boldly abstract of Matisse’s cut-out designs, with slivers and blocks of colour, broad areas of white, and several organic but mysterious charcoal lines suggesting a memory of movement at one further remove from figuration, disassembled, free-floating, almost the dream of a representation, but pointing the way to a generation of new painters who, especially in America, would, in the 1950s, take up where Matisse left off. Ruth Rosengarten © April 2014.